The African clawless otter (Aonyx capensis), also known as the Cape clawless otter or groot otter, is the second-largest freshwater species of otter. 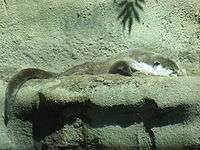 African clawless otters are found near permanent bodies of water in savannah and lowland forest areas. 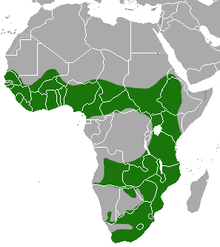 They range through most of sub-Saharan Africa, except for the Congo River basin and arid areas. They are characterized by partly webbed and clawless feet, from which their name is derived. Awkward on land but acrobats in the water, these animals spend their days swimming and catching food. They return to underground burrows (holts) for safety, cooling or a rubdown using grasses and leaves. Mainly aquatic creatures, their tails are used for locomotion and propel them through the water. They are also used for balance when walking or sitting upright. Quick in the water and burrowing on land, A. capensis does not have many predators. Its greatest threat comes from the python, which will often lay in wait near or in the water. Other predators would include the crocodile and fish eagles. If threatened, a high-pitched scream is emitted to warn neighboring otters and confuse a predator. 1 2 Wozencraft, W.C. (2005). "Aonyx capensis". In Wilson, D.E. ; Reeder, D.M. Mammal Species of the World: A Taxonomic and Geographic Reference (3rd ed.). Johns Hopkins University Press. pp. 532–628. ISBN 978-0-8018-8221-0. OCLC 62265494. 1 2 3 Hoffmann, M. (2008). "Aonyx capensis". IUCN Red List of Threatened Species. Version 2014.3. International Union for Conservation of Nature. Retrieved 9 April 2015. 1 2 Larivière, Serge (5 June 2001). "Aonyx capensis" (PDF). Mammalian Species. 671: 1–6. doi:10.1644/1545-1410(2001)671<0001:ac>2.0.co;2. ↑ African Clawless Otter. Arkive.org. 2011. ↑ African Clawless Otter. The Animal Files. 2011.